I GOT IN!!! I'm absolutely floored that i made it and have been nervously waiting to reveal my first challenge piece, which was to be anything we wanted as long as it was quilted and nautically inspired. may i present, Hold Fast! I opted to use mostly applique for this mini, i like the look that it creates when layering piece after piece on top of one another. And i think for things like the waves it was the perfect application to use. I used all shot cottons for the waves, i love the way the colours change with shot cottons and wish it was something that you could see in photographs! The roses (which i cut from my last piece of Anna Maria Horner's Social Climber print) were also another piece that i wouldn't be able to get the effect i wanted using another method. 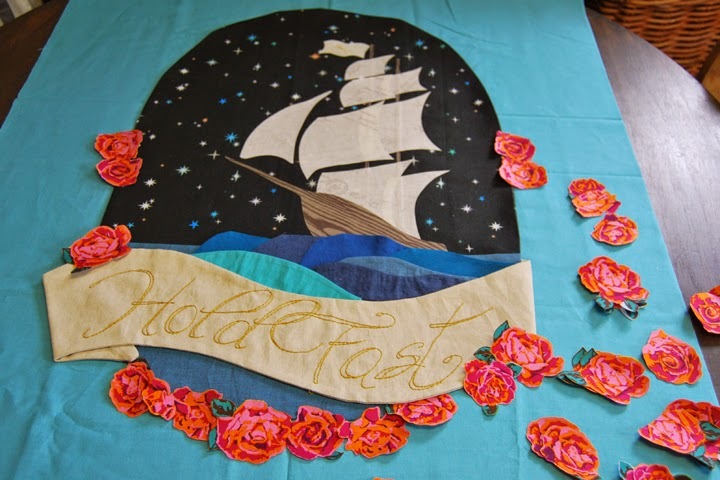 I embroidered the hold fast banner with 12wt Aurifil in brass, my all time favorite colour! And doubled up the fabric (Essex linen in natural) so i could get the folded look of a scroll. For those that don't know, the term Hold Fast (when used by sailors) means to bear down, grit it out, and stay the course. Such an appropriate term when working on a deadline! The quilting was varied throughout. The waves were all hand stitched with a chunkier stitch in 28wt Aurifil in teal, i think the chunkier stitch gives great texture and movement. In addition to sketch stitching the ship and sails i also hand stitched a few stars in the sky (Lizzy House Twinkle Twinkle in black). And the brass band around the whole thing, that was done with my zig zag stitch with the length set just a hair over 0. You have no idea how long it took to make two laps around the whole thing!! Forever! The rest of the quilting consisted of radiating lines in turquoise and brass 40wt Aurifil from behind the medallion, which were doubled up in the corners and center lines. Backed in another of Lizzy House's prints, Constellation in teal and bound in the same Twinkle Twinkle i used for the sky. This little mini finishes off at 27.5" x 35" and i have to say, for my third mini ever... i quite like it! High fives for all my awesome competition this round! It's been so much fun getting to know you all! What a beautiful ship. You are so talented and this is more like a piece of art. Good Luck! This is stunning!! Definitely a work of art!!! I love it, so darn creative! Use of the AMH social climber flowers is genius! Seriously it really and truly is great. I don't know how in the heck the judges are going to choose, so many great entries! This is great, Nicole! What a great title too. Very appropriate. =) I love your piece! GAAAAAAAAAASP!!!!! Breathtaking!!!! I have no words!!! How freaking cool is this!?!? AMAZING JOB!!!! absolutely stunning. I especially love the roses! Looks fabulous! Best of luck in this round of the competition! So, so awesome. I love all the details you put into this quilt! Such a fun idea and you carried it out beautifully! Really fabulous! I love the strength of the ship and the Hold Fast message. I love what you've done here - it's quite different from the others and it really stands out for me. I voted for you! Love that you cut out all those roses and the ship...is AHHmazing! You knocked it outta the ocean! I voted for ya. Twice. :) My daughter would approve of the pirate inspiration. I love the rose detail - I never would have thought of that, and it's just fantastic. And the "Hold Fast" is perfect on the front. I'm in love with all of the details you included!! Very, very cool, and well done. Wow, just checking out everyone else's entries. The compitition is fierce. I can see this Sewvivor challenge must be pushing everyone's imaginations to the brink. How awesome. I'm really looking forward to seeing more. Good luck! i love this so much! what a greta idea to cut out all those little roses, and the ship in the middle is so cool looking! you also used one of my favorite fabric lines ever, lizzy house constellations! great location for the photo shoot too! Wow!!! I am a little late to the party here at your blog but I did read the story at Family Ever After after you said it was up on IG. I have thought you were a sew-lebrity from the day I met you on Flickr and I am so glad that so many others are figuring that out too. You did an amazing job on this in every aspect and am wondering if this may be your new tatoo?!?! Seriously awesome photos too! Will this be hanging in the boys room ( doesn't go with rockets but maybe Sammy will come up with some pirate frog in a rocket theme that you will create for him ;) I had a hard time nailing down my votes....except for you...you were my first pick! Seriously, Nicole, this is such an amazing quilt! You chose the perfect fabrics and I am in love with the roses you made! Great job and good luck! I think the roses are my favorite part. The whole thing is beautiful! Love it! As soon as I saw the top photo pop up on feedly on my phone I thought of Hook and Neverland. It is a really lovely mini! I love your mini and the inspiration behind it!! Not sure my imagination would have gotten me that far.... Amazing job well done!! You totally nailed this challenge! Ingenious design, and you executed it beautifully, down to the last detail. I kinda want to get the tattoo version! If you ever consider selling this, please let me know! it's simply epic.